Clarissa’s first and eighth test print next to each other. 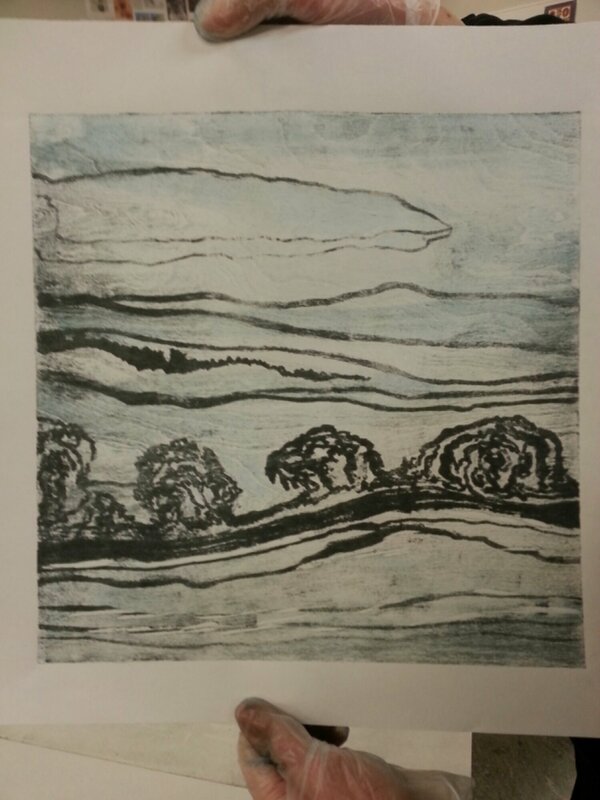 she also reused this block from the first (purple and blue) test prints. Christa also used tusche, which quickly lifted off the plate. – The materials that we used included birch plywood and oak ply, sharpie paint markers, sharpies, litho crayons, china markers, and lithographic tusche. – Ewa’s process involves using foam rollers instead of brayers, however we found that a regular printmaking brayer works well. – In our process, lithographic tusche did not work – it lifted off the plate and didn’t print. We did not determine whether this was due to the type of tusche, or its age. Clarissa recommends using new materials for drawing, whether it is ink or sharpies. – Two hours is the stated minimum processing time. We left our plates processing overnight, and it seemed that less greasy drawing materials needed more time to process. However, Clarissa has been able to get an image to ink up after 45 minutes of processing. – Sharpie paint marker worked the best! Regular sharpie did not show up, but left traces on the block that inked up after several passes. Clarissa found that colored paint markers (she used red) make it easier to see when your block is completely inked up. – Beware of brayer marks. This technique is quite messy as ink will quickly transfer from plate to sponges to hands. Work quickly and avoid over inking your plate as this may cause the background to scum. – The ink must be very runny – adjust this with linseed oil. Clarissa also had success using setswell or easywipe to make the ink less sticky. 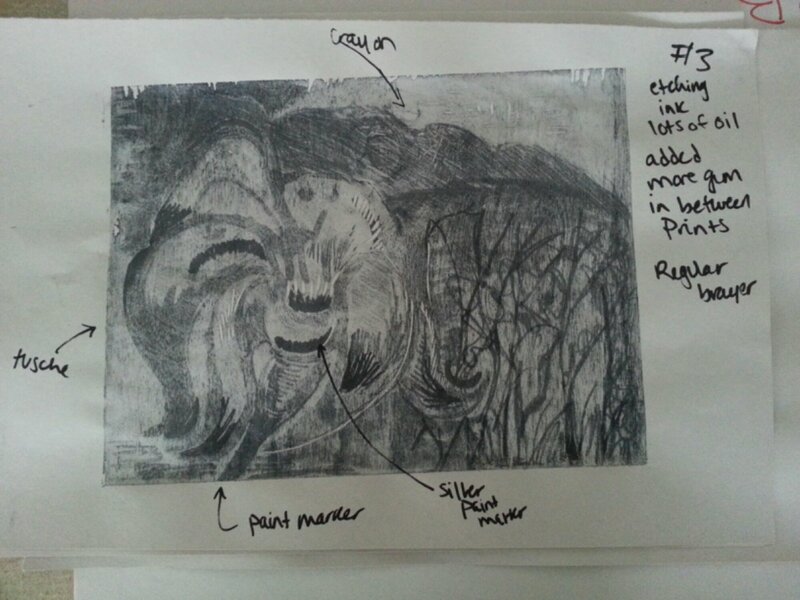 – This process is very similar to gum Arabic transfer and monotype, as you will not always be able to tell when you will get a good print, and the drawing materials may begin to break down depending on what was used. Clarissa was able to print a plate with paint marker for an edition of 8 with no sign of disintegration, but the block will most likely only hold up for an edition of 10-15. – Similar to lithography, mokulito works best when the plate is not too wet, as water will lift the ink up off the surface. If your brayer is picking up ink from the slab when you recharge it, there is too much water on your brayer. – Use quick passes to “snap up” ink with the brayer, as you would with lithography. – When you change colors, there is no need to clean off the plate – simply roll up with the next color. You could try to roll excess ink off on newsprint. – Think of your image as having plate tone from the wood. If you want white, use woodcut tools to carve it out. – Birch plywood grain comes through upon printing, and it is difficult to tell where grease from handling may appear. Stickers from the hardware store will pick up ink and should be paid attention to. It is advised to sand the wood as much as possible for a smooth, stone like surface. – Shina plywood provides a smooth surface with less grain. – Oak plywood had a strong grain, was difficult to carve into, and took longer to soak up the oil from drawing materials. If you are looking for a print with lots of grain, this could be advantageous. – Ewa states that plates cannot be reused, but Clarissa had some success with marks showing up with an old plate that was re-gummed and reprinted. However, when she tried it a third time the block rolled up completely, probably due to the oil in the ink becoming part of the plate’s image.